Wellington is windy. The wind's direction and strength play an integral part in this city's life. It determines whether or not a sailing on the ferry to or from the South Island is a good day out, or a dangerous and deadly event. It determines whether sitting outside on a sunny day is a lovely way to pass time, or will involve being hit in the head with flying objects. It might even determine whether you can walk or not. It's fair to say that I do a lot of this complaining. The wind plays a big part in my life, though in subtle ways. My choice of vegetables and fruit to grow is largely determined by the wind, or at least that's the reason I give for never, ever growing runner beans. All my crops stay close to the ground. I won't grow climbing peas, and even dwarf peas get staked. I wear my hair long, with no fringe, so that I can tie it back and not have it in my face. I check Metservice for wind strength and direction more than for sun and rain. I choose to walk home a particular way because other routes are windier. But this year, I will not complain about the wind. Instead, I will focus on all the ways wind enriches my life. Wind is a cheap gym. Trying running against a gale force northerly. It's resistance and cooling all at once. Wind has a purifying effect. The air here is always clean. I don't have to worry about airing out the house, because you open a window for ten minutes and voila, airing is done. Washing takes less time to dry in the wind. Wind is dramatic. It howls at windows. A good southerly is like a kid dancing, making all the trees and curtains and things that aren't tied down dance with it. It whips up the harbour in different directions. It sends clouds racing over hills, it makes magnificent sunsets. Wind means no-one in this town can use an umbrella. I really dislike umbrellas. Or more accurately, I really hate being poked in the eye by the ends of an umbrella's spoke. I love to see umbrellas that have been sucked inside out by the wind stuffed into rubbish bins. Wind makes landing at the airport a newsworthy event, though I've had far worse landings in Auckland. 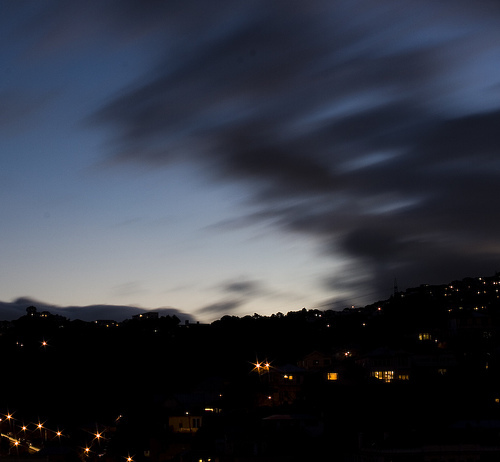 If you live in Auckland or Reefton or somewhere not windy, you don't appreciate the beauty of a truly still evening like those of us who are used to being buffetted. Those still evenings when the cicadas are sizzling and people are out walking their dogs are jewels; when leaves stay on the ground, when the water coming out of your watering can goes on the plants you are aiming it at. Those times are times to sit, to watch, to admire bees bravely going about their business. I know lots of people who couldn't live here because of our weather. Sometimes I have thought of moving somewhere less active. But there are so many great things about this place, that the wind is a small price to pay for it. I come around that corner on SH1 where the harbour bursts out to meet you, I see the city huddled into it and the ingenious ways people have created a place to live and be here, and I know this will always be home. i miss it a tiny little bit. london gives good storm wth satisfyingly fat rain drops, and is mostly bessedly, windless. This should be in the Dom Post. I hate how I have to put away the clothes line in winter - nothing will dry here in Kent, whereas in Wellington, even an hour out in the winter wind will be enough. It is nice in the sun, when there is no wind, so still, so calm. But we will be coming back to Wellington to live in the near future - there's nothing like four season in one day to keep you alive!